Meesho App Resellers Diwali Offer:- Meesho has become one of the trending apps for the resellers to earn the profit by reselling the products from "Meesho App". Resellers are selling the Meesho's products on various platforms like WhatsApp or Facebook to get a chance to win Dubai Trip & Redmi 6 Mobile. 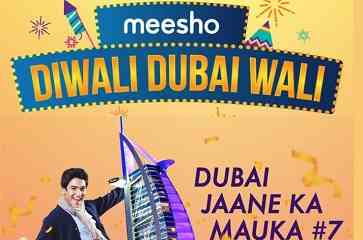 Meesho App is running the "Diwali Contest" where they are teasing Resellers to sell more products from the Various Categories to be the Top Resellers to get the Chance to Win "Diwali Dubai Wali". Top Resellers means if the resellers would be able to stand at Rank #1 he'd get "Dubai Trip". Instead of this if you are in the list of 70 Runners-Up to become the Top 70 Resellers then you'd be able to win Redmi 6 Smartphones. So if you are one of those Meesho Resellers who is waiting to get a chance to Win this "Meesho Diwali Dubai Wali" apart from earning 250 Rupees by referring the Meesho Products. Then start referring more people to Meesho so that you can secure your Top Position in the Meesho's Top Resellers Leaderboard of Diwali Dubai Wali. It's easy to be the part of the Meesho Resellers Diwali Dubai Wali Contest. You just have to Refer more people to buy the various categories products such as KURTIS, BEDSHEETS, SAREES, REFERRAL SALES, WESTERN WEARS, JEWELLERY, MENSWEAR. If you are one of the top-most resellers in the above categories. Then you can be one of the winners for this Meesho's Diwali Dubai Wali. How To Be The Part of Meesho's "Diwali Dubai Wali" Contest? First of all, Download the Meesho App. Open the App & Enter Your Number & Verify it with OTP. Now Go to this Post & Read how to get "Refer & Earn" option in Meesho's New Account. After this Start Referring Meesho App to People & Sell Maximum Number of Products from the Given Categories. For championships No. 1,2,3,4, 6&7, the winner will be decided on the 'number' of products sold in that particular category. For the Maximum Sales by Referrals contest, the Winner will be decided based on the total sales of all new referrals created by a user in the contest period. 1 winner of each' championship will win an all-expenses paid for the trip to Dubai for 2 people for 4 Nights 5 Days. 16th July to 3rd November 2018. Travel duration cannot be extended. Only new Referrals who have signed up within the offer duration will be considered. Winner of the Referral championship will be determined by total sales of all orders placed by their Referrals in the offer duration period. Eg: A invites a Referral who makes sales worth Rs.1 Lakh in the offer period and B invites 5 Referrals. Who collectively make sales worth Rs.50,000 in the offer period. In this case, A will be the winner. Meesho reserves the rights to disqualify Resellers who are found to be indulging in fraudulent Referral practices. o If the Reseller is found to create ingenuine referrals or fake accounts. o If the Reseller is found to have too many customers overlaps with his Referral. So this was the post about Meesho App Diwali Offer, Where you can get a chance to win Dubai Trip by reselling the products from the various categories to the people. Make sure they use your Meesho Referral Code to place their order. Refer more people to get the higher #Rank in the Leaderboard of this Diwali Contest of Meesho App to win exciting prizes.